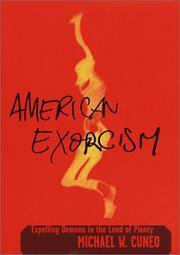 An evenhanded assessment of a volatile subject: demonic possession and expulsion among modern-day Americans. Cuneo (Sociology/Fordham Univ. ; The Smoke of Satan, 1997) incorporates sociological and anthropological viewpoints into his exploration of the religious underground’s promotion of exorcism as a necessary service—something that Catholicism has publicly forsaken. The popular fascination with demonic possession is easily traced to William Peter Blatty’s Exorcist; despite the effort to ground his work in a real 1949 incident, the movie version (recently re-released) fit well within a time of cultural hysteria that culminated in 1980s-era pursuits of Satanic cults (embodied by heavy-metal fans and day-care centers). Cuneo adroitly defines contemporary exorcism reality as a manifestation of the “therapeutic ethos of the prevailing culture,” in that participants are able to blame personal ills, from anxiety to promiscuity and substance abuse, on infestation by demons. He discusses (and interviews) many significant figures who have promoted exorcism rituals across diverse faiths, developing insights on how the “down and dirty” Pentecostal deliverance ministries differ from relatively conservative Episcopal charismatics, and recent efforts by the Roman Catholic church to authorize priest-exorcists. Many practitioners the author encounters are appropriately skeptical about it all, yet seem to succeed in addressing the moral turmoil of their clients through these rituals (indeed, Christian psychotherapists are involved in the exorcism movement). Some of exorcism’s most prominent promoters, though, such as ex-priest and Hostage to the Devil author Malachi Martin and “self-styled psychic sleuths” Ed and Lorraine Warren (of Amityville fame), seem dubiously reliable at best, but are hugely influential regarding popular ideas about the occult. Cuneo takes some delight in depicting earnest Middle Americans vomiting, cursing, and writhing in carefully conducted rituals, but he admits that he’s encountered little that evoked the dark netherworld of honest-to-God possession. An engaging and detailed document of a provocative subculture, in a study that will neither confirm nor confound the reader’s demonic fears.